Between 1989 and 1995 the former Department of Community Affairs ( now within the Florida Department of Business and Professional Regulation - DBPR) developed standards for radon resistant new construction and the mitigation of radon in existing structures. The standards for radon resistant new construction are divided into two categories: residential and large building. The residential standard is for single family homes and duplexes. The large building standard applies to all other construction. The standards are applied according to the DBPR Radon Protection Maps. These maps identify areas in the state where additional radon resistant construction features in new construction are recommended. Currently these standards are voluntary. It would take a majority of the building permit issuing agencies in any county to adopt them for the standards to become a require code within that county. All mitigators are required to follow the mitigation standards as a condition of their radon mitigation certificate. All PDF documents below open in a new window. You may need to download the Adobe Reader. The Florida Standards for Radon-Resistant New Construction (RRNC) are currently included as appendixes of the Florida Building Code. Department of Business and Professional Regulation as a HTML documents or as a PDF files. The PDF file provides you with the same format as we mail to people. Please note that these are not official copies of the Standards. Those are only available from the Department of Business and Professional Regulation, Bureau of Administrative Code at (850) 487-1824. The residential standard includes, as an attachment, Design Guidance For Residential Active Radon Control Systems. The residential radon resistant standard is included the Florida Administrative Code, 9B-3, by reference. This standard should be applied according to the DBPR Radon Protection Map. Florida Standard for Passive Radon-Resistant New Residential Building Construction (Appendix F - Chapter 9B-52 - 84 KB PDF). The large building standard is included in Florida Administrative Code, 9B-3, by reference. This standard should be applied according to the DBPR Large Building Radon Protection Map. This is a list of construction contractors that have attended the Department of Health's sponsored Florida Homebuilders Association trainings. 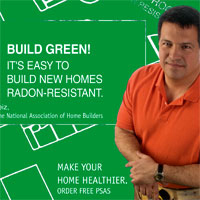 These trainings are awareness courses on the radon resistant new construction (RRNC) techniques of the Florida Statewide Building Code. The Florida Home Builders Association will be providing such training in the future.